Two weeks in Japan is the ideal amount of time to really get a feel for a nation known to favour cultural tradition and respect above all else. 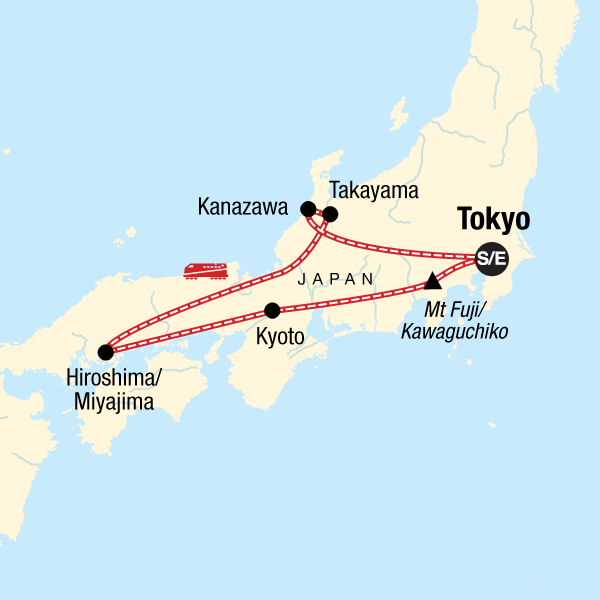 Starting this small group tour in Tokyo lets you hit the ground running before turning attention to train travel as you head northwest to Takayama, Kanazawa, and onwards to Hiroshima. A combination of guided tours with local experts and space to explore at your leisure makes this a relatively affordable adventure holiday, although Japan is not for those on a budget. Heading back to Tokyo via the gorgeous ancient architecture of Kyoto and the inevitable highlight of hiking to the top of Mt Fuji, provides a fantastic climax to this unforgettable two week holiday. From the super speedy Shinkansen bullet train to the peaceful surrounds of a traditional ryokan, this adventure tour exemplifies the country’s cultural and natural contrasts to leave you in no uncertain terms as to why Japan still has the WOW factor. Group size: In order to keep the environmental and negative social impact of travel to a minimum, we operate this tour with a maximum of 15 passengers. Accommodation: The majority of our hotels are small, locally owned and family operated establishments. This tour includes two nights in hotels and eleven in traditional inns. Local guides and operators: By working with local guides and operators, we provide economic benefits directly to the local people and businesses. Our local guides are experts in flora, fauna, history, culture, and provide our travellers with insight into local knowledge. Tour leaders: Our tour leaders receive special training in low-impact travel and regional conservation issues and projects. They are also provided with a Sustainable Travel Manual. Tour leaders are selected based on their knowledge of, and commitment to sustainable travel. All our tour leaders speak English and have first aid and CPR certification. Our foundation: Through our commitment to responsible tourism we have developed our own foundation, a non-profit organization dedicated to making a positive difference in the lives of people and communities around the world through support of international charities, local organizations and community projects in the places that we visit on our tours. Through this, we support the Seva Canada Society, an international non-governmental organization dedicated to the elimination of preventable and treatable blindness. Seva has worked in Nepal and India for 25 years and more recently in Tibet and Tanzania. Today, nearly 40 million people are blind with ninety percent of the world’s blind living in developing countries. Another 135 million have debilitating low vision. The good news is that most of this blindness can be prevented or cured. Half of the world’s blindness is caused by cataract that is reversible with a 15-minute operation costing $20 - $50 in most developing countries. A painting exhibition in Hiroshima. It actually isn't that difficult getting around Japan but a few simple Japanese phrases help break the ice. We had very little interaction with local people and employed no local guides which was really a pity. We impacted on the environment just as much as any other tourists. Dear Margaret, thank you for your comments. Sustainable tourism is a core part of our company. If you have any suggestions, comments, thoughts or ideas on how we may lessen our impact on the environment, and embrace the local culture more, we would be thrilled to hear from you. If you are so inclined, please drop us a line to discuss this further.